You can file for divorce just six weeks after moving to Nevada. Divorce without ever going to Court--no hearing required. Get your judge-signed Decree in the mail in just 2-3 weeks. If you and your spouse are no longer compatible, you have met the requirements for divorce on the no-fault grounds of incompatibility. All Nevada divorces are filed at the District Court Clerk's office in the county where either spouse currently lives or in the county where the spouses last lived together. If you can't afford the divorce filing fee, file an Application and Affidavit to Proceed in Forma Pauperis. This document asks the judge to waive the filing fee due to financial hardship. 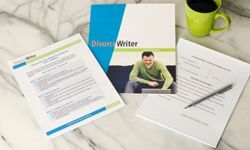 Your DivorceWriter purchase includes everything you need to get divorced in Nevada including step-by-step instructions to guide you throughout the divorce process. If your documents are not accepted by the Court, DivorceWriter offers a money-back guarantee. You have qualified to use DivorceWriter to complete your Nevada divorce papers online. Select "Continue" to start the interview.